Best Ductless Mini Split Fredericksburg, VA | Robert B. Payne, Inc.
What is Electric Air Conditioning and Split-Zoning Air Conditioning? For decades, split-zoning air-conditioning and heat pump systems have been the solution for cooling and heating problems around the world. Our staff at Robert B. Payne, Inc. takes pride in being a leading local electric air conditioning expert offering practical and state-of-the-art products and services with the goal of making your life more simple and comfortable. Our quiet and powerful air conditioning and heating systems have three main components: an indoor unit, outdoor unit, and remote controller. Installation is as simple as mounting the indoor and outdoor units, connecting the refrigerant lines, and making a few electrical connections. 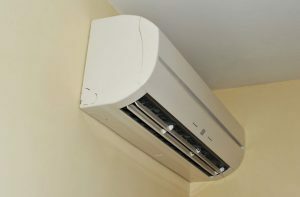 Ductless mini split air conditioners are an exciting new innovation in the cooling industry. Before now, most homeowners had to deal with expensive overhead ductwork. Over time, dust and debris can accumulate within the ductwork, lowering efficiency and airflow. A ductless system removes such issues, along with the need for ductwork installation. These units bring cold air directly into the room, allowing for better cooling efficiency. Efficiency is the most significant advantage of a ductless system. Other advantages include lower operating costs, longer lifespans, and less maintenance. The only downside is the initial cost of investment. However, homeowners will quickly recoup these costs. These benefits make ductless systems a wise investment for many homeowners! Nobody should have to come home to sweltering heat after their air conditioner breaks. One of the major issues that typical air conditioners face is unclean ductwork. Over time, dust and debris will accumulate in the ducts. This blocks airflow and reduces the system’s efficiency. A split system avoids these issues simply because it does not use ductwork. If you want to increase your home’s efficiency and decrease the likelihood of air conditioner breakdowns, you should consider investing in a ductless mini split air conditioner. Whether you’re renovating and want to upgrade or you’re building a new home, a ductless system is always available. There’s never a bad time to upgrade to a mini split unit. At Robert B. Payne Inc, we can install both the outdoor and indoor units together. We’ll make sure the entire system functions properly before we leave you to your comfortable home. Why Choose Robert B. Payne, Inc. for Your Electric System Needs? Robert B. Payne, Inc. is local forerunner within the split-ductless air-conditioning industry. The products our company stands behind are the best in the business and are known specifically for their stellar performance for quiet, easy-to-use, and energy-efficient operation. And because our split-ductless technology is backed by our trusted, professional technicians and by our company name, you know that every product we offer is built to last and every service we provide is performed with maximum skill and precision. The bottom line is that Robert B. Payne, Inc. delivers the ultimate in comfort control for your home or office. It’s true today and will be comfortably evident for years to come. Where Can These Electric Products and Systems Be Used? If a room is too hot or too cold, Robert B. Payne, Inc. can handle it! Mitsubishi split-zoning systems are specifically designed to improve the comfort level in an uncomfortably hot or cold room of an existing building. Because they don’t require ductwork, they’re the perfect heating and cooling systems for renovating older buildings that were constructed before air conditioning was available – even those with plaster walls and brick facades. They are an excellent choice for almost any spot cooling or heating situation, including enclosed sunrooms, upstairs bedrooms, classrooms, hospitals, nursing homes, restaurants, hotels, workout rooms, computer rooms, offices and churches. On top of that, they’re extremely easy to use. Setting the controls for the exact room temperature that you want is simpler than you can imagine. Zone temperature control is only a few clicks away! They’re also equipped with an anti-allergen filter and prevent the cross-flow of air with contaminants. Not only can you improve your level of comfort but your air quality as well. These Electrical Cooling & Heating Systems can fit into almost any space because their innovative engineering optimizes the capabilities of the INVERTER technology and R410A refrigerant for more efficient systems with smaller indoor and outdoor units. R410A refrigerant is environmentally friendly, with zero Ozone Depletion Potential (ODP). The units themselves are also made of recyclable materials. If you’d like to learn more about our electric split-zoning products or systems, why wait? Call Robert B. Payne, Inc. today to speak with one of our Heating & Cooling specialists. Let us improve the quality and comfort of your life, one degree at a time.